From the brilliantly witty and exuberant New York Times best-selling author Ken Jennings, a history of humor - from fart jokes on clay Sumerian tablets all the way up to the latest Twitter gags and Facebook memes - that tells the story of how comedy came to rule the modern world. For millennia of human history, the future belonged to the strong. To the parent who could kill the most animals with sticks and to the child who could survive the winter or the epidemic. When the Industrial Revolution came, masters of business efficiency prospered instead, and after that we placed our hope in scientific visionaries. Today, in a clear sign of evolution totally sliding off the rails, our most coveted trait is not strength or productivity or even innovation but being funny. Yes, funniness. Consider: presidential candidates now have to prepare funny "zingers" for debates. Newspaper headlines and church marquees, once fairly staid affairs, must now be clever, stuffed with puns and winks. Airline safety tutorials - those terrifying laminated cards about the possibilities of fire, explosion, depressurization, and drowning - have been replaced by joke-filled videos with multimillion-dollar budgets and dance routines. 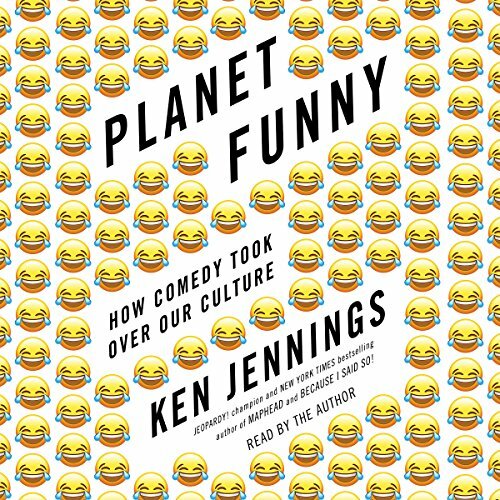 In Planet Funny, Ken Jennings explores this brave new comedic world and what it means - or doesn’t - to be funny in it now. Tracing the evolution of humor from the caveman days to the bawdy middle-class antics of Chaucer to Monty Python’s game-changing silliness to the fast-paced meta-humor of The Simpsons, Jennings explains how we built our humor-saturated modern age, where lots of us get our news from comedy shows and a comic figure can even be elected president of the United States purely on showmanship. Entertaining, astounding, and completely head-scratching, Planet Funny is a full taxonomy of what spawned and defines the modern sense of humor. PLANET FUNNY is a broad set of essays on contemporary American comedy without much of a central thesis. Jennings does make assertions about various aspects of comedy, but he supports them with evidence on par with a newspaper editorial or a well-written high school essay. He also is constantly hedging, resulting in observations that are more descriptive than insightful. Some of the assertions, especially around the historical progression of comedy, seemingly contradict each other, though each is hedged in the specific context of its own section. The book is at its best when it leverages Jennings' access to notable and interesting figures in the comedy world, as well as his own experience as a successful Twitter user and podcaster. Twitter gets outsized treatment in the book, but that is entirely warranted given the insight Jennings has from his 20+ thousand tweets to over a quarter-million followers. The humility and detached observational tone he uses actually end up making it seem like he assumes every American has an active Twitter account with at least a few tens of thousands of followers responding to their every quip, which provides a bit of unintentional amusement for the listener who does not. Toward the end of the book it gets a bit more personal and reflective, but it never goes far enough to make more than the most anodyne statement. I could not tell you the author's actual affirmative view on morality, for instance, except that he seems sensitive to general standards about regretting harm or offense, and his values are likely in-line with the cultural milieu of his Twitter wit peers. But he never really lays his soul bare about post-modern relativism, comic hedonism, Twitter addiction, alternatives to screen time, his work or personal life, or anything you'd call impressively honest autobiographical writing. The tone remains almost entirely anthropological until the too-short last chapter, when he seems to be approaching some interesting personal reflection that he chooses not to engage - at least, not in this book. This is disappointing because to the extent there is a central thesis, it would be something like "Comedy is taking over everything and maybe it shouldn't," which naturally leads the listener to wonder why, and what alternatives the author has in mind. I strongly recommend BRAINIAC and MAPHEAD (though the latter in print), which also take an anthropological view but do so with more depth. I read BECAUSE I SAID SO before I was a parent; I recall enjoying it then, and I wish there were an audio version to revisit now. Jennings' great strengths are his fluency with obscure and interesting angles on a topic (well-represented in PLANET FUNNY) and his actual sense of humor. Ironically (I believe I am using that right - there's an excellent essay on it in the book! ), his actual wit is a bit neutered by the subject matter of comedy. It's hard to be funny about comedy. I look forward to listening to whatever Jennings does next, including staying current on his above-average podcast Omnibus, but I hope that he can return to form with either a more focused exploration of a specific topic (like Brainiac and Maphead) written in his clever and insightful voice. And I really hope to someday get a more personal and revealing work. I have the sense that Jennnings feels maybe comedy has become too large a part of his own personal and professional identity, and would really enjoy hearing him work through that in the confessional style of some many public-therapy podcasters and comedians. The audio version is read capably by the author. He does some light tonal and impression work without fully committing to it, which is consistent with his written voice as described above. The .pdf with a half dozen or so hand-drawn charts is excellent and worth looking at. Ken Jennings, for those who don’t remember, was the guy who won Jeopardy 70-something times in a row. I’ve been a fan of his since then, originally for his old blog entries, sporadically for his hilarious Reddit AMA’s, and recently for his ‘historical detritus’ podcast The Omnibus. I never got into Twitter but apparently he’s the bee’s knee’s over there too. What I like about his writings, I think, stems from his massive knowledge base. He’s like an old stoic war veteran calmly rattling off life stories, except instead of grizzled tales of torture and beheadings, he speaks of Damn Girl memes and old episodes of Freaks and Geeks. What I mean by that is that he doesn’t embellish meaning or overstate significance. I imagine that for his trivia-stuffed brain, no one piece of information feels overly significant. This is appropriate here because this is a minor work. I don’t mean that in any negative sense - the book just takes a social trend, delineates it well, explains it concisely, and does so in an enjoyable package. The main thesis of the book is that due to various technological and social trends, humor has pervaded modern lifestyles to an all encompassing degree. There’s some thought put into whether this is a good thing, but the only consequence mentioned is that it may be taking something from sincere expression of emotion. The most biting the book becomes is from a short section against the vaguely fascist humor troupe Million Dollar Extreme, but even that’s more generally against the inherent uncertainty associated with that infinitely-ironic dadaist style of humor they use. The most enjoyable moments of the book to me came in Ken’s recollection of his own humor background. His admiration for MST3K, his citing of random twitter jokes, and even just minor stories about his quaint family life. Perhaps the slightness of the book also comes from Ken’s own sense of humor, since it’s inevitably hard for a constant-joker to argue a case that humor has any seriously deleterious effect on the world. The premise is that comedy has entered all sorts of places in our lives: news (e.g., The Daily Show), etc. However, the book is really long to make the point. I would listen sometimes and wonder why something is being discussed beyond simply being related to comedy. It wasn't bad enough to return but not good enough to recommend to someone else. A very funny man questions where the humour should stop in our modern society. Thought-provoking. Ken Jennings offers a look at what makes us laugh now and what worked in the past. Smart, interesting and funny. A fascinating look at how comedy has evolved and why it has evolved the way it has. Both insightful and humorous, this book is thoroughly enjoyable for anyone interested in comedy and how it has shaped our culture and vice versa. The narration is fantastic and provides for a wonderful audiobook experience. I write the negative take because when I go to look at reviews, I always start with the most critical. Hype is easy - I want to know why people DIDN'T like a book. As evidenced by the 4 and 5 stars, I quite enjoyed this book. I did not like the noises. First, there were tweet-y noises to signify tweets. Annoying and I thought unnecessary. The book was also peppered throughout with "four-letter-words," each one bleeped. Ugh! First, the "bleeps" didn't completely cover the word in question, so if one were to be offended by the language, it just got a whole lot more highlighted! I wish they would have either completely covered the words, chose different less-offensive words, or best of all just left them as is and put an "some explicit language" warning on the summary. I really wanted to enjoy this, but he just gives his opinion on the history of humor. It turns into just one long monologue.